Dining out at one of Miami’s exclusive hot spots isn’t just about the amazing food. It’s more about being surrounded by the beautiful restaurant décor, the glamorous crowd, and having the best table and the impossible 9pm reservation. Take your pick of one of Miami’s top restaurants below and be sure to experience what Miami is known for- excellent steakhouses, playful dishes, fresh ceviches and any cuisine inspired by Latin America. 1. Barton G is a special occasion restaurant known for putting an unexpected twist on traditional comfort foods-Mouse Trap Mac and Cheese and Lobster Pop Tarts anyone? Cocktails created with liquid nitrogen are guaranteed to make your celebration a memorable one. At $36 this is Miami’s most expensive martini. Bottoms up! For an unforgettable dining experience reserve a table at the former Versace Mansion location. 2. Casa Tua: Translated to mean “Your House” you’ll feel at home thanks to a cozy Ralph Lauren inspired decor. Feast on the best Italian food in Miami with homemade gnocchi, delectable sea bass, and the best tiramisu you’ll ever have. For large parties, try to snag the chef’s table in the kitchen where you’ll really feel at home. If you want to dance the night away or finish off dinner with a passion fruit margarita try your luck at getting into the members only lounge upstairs. 3. Nobu: If you think Nobu is so 10 years ago, think again. Tucked away in the Shore Club hotel this place is still jam packed, so unless you want to sit at the sushi bar call ahead for reservations. With a glamorous crowd and menu that’s perfect for a late, pre-clubbing dinner this place gets the party started early. 4. BLT Steak: Chances are if you’re dining on Ocean Drive you’ll end up overpaying and eating sub-par food, but BLT Steak is the exception offering a classic steakhouse menu, attentive service, and a fine dining experience. For dinner enjoy the Ceasar salad, porterhouse for two, creamed spinach and fontina and bacon baked potato. Located in the Betsey hotel this is the place to see and be seen on Ocean Drive. 5. 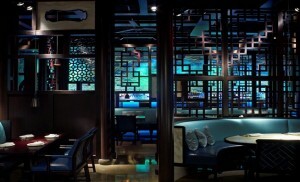 Hakkasan: Impeccable decor and well thought out dishes bring this London restaurateur to South Beach. The Fountainblu offers lots of five star restaurants that can easily empty your wallet, but if you’re if you’re in the mood for Chinese you’ll want to visit Hakkasan. Highlights of the menu include the jasmine tea smoked ribs, stir fried lobster, and wild mushroom hand pulled noodles. 6. Joe’s Stone Crab: The top spot in Miami to try to sweet, succulent, Stone Crabs when they’re in season. Packed with tourists and only open during stone crab season, be prepared to wait for a table. If you opt for a table at the bar you can still order the famous stone crabs along with appetizers. They like to turn over tables quickly, so be warned that they may rush you. 7. 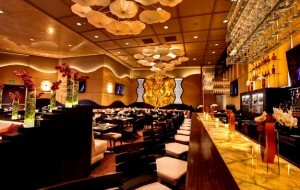 Prime 112: With so many mouth watering steak houses in SoBe to choose from, somehow everyone ends up at Prime 112. Try the double wedge salad (Iceberg and Butter lettuces) and personalize the classic filet with a long list of sauces that include Béarnaise and Chimichurri. For something different try the fondue and Kobe beef sliders. If you make last minute reservations prepare to decide on a table at either 6pm or 10pm. 8. The Restaurant at the Setai: If the weather cooperates sit outside and you’ll feel as if you’re in the South Pacific thanks to the amazing design and tables that offer lots of privacy. Feast on spicy noodle dishes, the best hot and sour soup, Wegu beef, and their signature cocktails with chili flakes and passion fruit juice. Tables are made for lingering and service is never rushed, so if you never took that honeymoon to Fiji now’s your chance. 9. Azul: Located at the luxurious Mandarin hotel on Key Biscayne this five star restaurant offers a European menu with an Asian and American twist. If the open kitchen and stunning Bay view don’t impress you, Chef Joel Huff’s innovative menu will. Highlights include American caviar, almond gazpacho, risotto with duck prosciutto, and the highest grade of Wegu beef (A5) served with truffle and white asparagus. For a truly memorable dining experience take a boat to your own private table. Villazzo offers the most luxurious vacation villas in Miami, FL. This entry was posted on Thursday, May 8th, 2014 at 2:13 pm	and is filed under Miami, Miami Beach Luxury Travel. You can follow any responses to this entry through the RSS 2.0 feed. You can leave a response, or trackback from your own site.